An appeal on behalf of ECPAT UK, a charity that campaigns against child trafficking, and helps children who have been trafficked to recover from their experiences. Browse content similar to ECPAT UK. Check below for episodes and series from the same categories and more! I'm always appalled when I hear about people trafficking. and kept both hidden and silenced. These are boys and girls that desperately need our help. we need to protect her identity. We're not using her real name, and her words are voiced by an actor. Now she's a young mum who loves to cook for her children. until she was 13, when they left her to live with another family. her daughter and get an education. It sounded like a good opportunity. Her mother said I was coming here to look after her two children. go to school myself, because I didn't know how to read or write. Lisa realised she'd been badly misled. and serving the woman's family. There was no chance to go to school. she was effectively a slave. I had to wake up at five o'clock and start cleaning the house. if I'm not doing my job properly, she will do anything to hurt me. She beat me. She pulled my hair. She kicked me. She made me sleep in the cold. She said, "Your parents are not here. "Who is going to come to look for you? Nobody." it's such a hidden problem, the exact figures are hard to come by. like drug cultivation and sexual exploitation. extreme violence than ever before. "I'm not going to survive this time, so I have to escape from her." Lisa fled, empty-handed, into the unknown. I was just walking down the street, and I was not wearing any shoes. I was crying. I was like, "I'm nobody." but it took time to persuade them that she was a child. a fake passport that said she was in her twenties. by the male residents before she was finally given a foster home. going through similar things right now, here in this country. But there is something you can do to help. important work in helping to piece those broken lives back together. by British citizens elsewhere in the world. Debbie works closely with young people who have been trafficked. projects to help survivors move on and deal with their experiences. in touch with the charity by her lawyer. Every Friday I'm thinking, "I can't wait to go to the group." When I come here, I'm so happy. and to understand what safe relationships are. because of course, a lot of time, they've missed their childhood. from taking place behind closed doors all across Britain. so they can give them the proper care. But identifying these vulnerable children is hard. They're told what to say by their traffickers. but actually, that in itself is an indicator of trafficking. like this 24-year-old. We'll call her Sophie. You may find her story upsetting. and immediately given domestic tasks in a stranger's home. like literally tidying up the whole house. "You need to smarten up the bed." different men coming to the house. That's the scary bit about it. I ended up being made to sleep with these men. and this enraged her captor. "If you don't do this, then you will need to get out of my house." She then pushed me out of the house, chucked my things out. I ended up walking away from the house, and I kind of got lost. Sophie was homeless and penniless in a country she didn't know. And from there, I was roaming about. jumping on buses just to keep warm. I had nowhere to go. I was literally depressed. by ECPAT UK to cope with their incredibly traumatic experiences. but others from Vietnam and Bangladesh. I want to know what ECPAT UK means for them. Basically, because we've all been through the same situation. "you're not alone, and you didn't go through all that by yourself." We only want to feel safe and to feel we have care from each other. And just being with other people who have been through your experience. Without their support, I wouldn't be where I am today. I have my two children. I go to college. I'm working as a carer. So I'm so happy now. considering what they've been through. and that's thanks to ECPAT. make their lives worth living again. So please give generously. and the whole £10 goes to ECPAT UK. ..writing ECPAT UK on the back of the envelope. 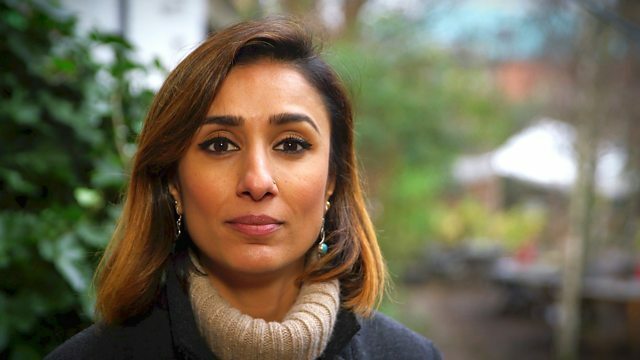 Anita Rani presents an appeal on behalf of ECPAT UK, a charity that campaigns against child trafficking, and helps children who have been trafficked to recover from their traumatic experiences. Nearly a thousand children are known to be trafficked into Britain every year. Some are forced into cannabis cultivation, sexual exploitation or made to work as domestic slaves. Anita hears the distressing stories of Lisa and Sophie, who were both young girls when they were forced into domestic servitude in the UK. With the help of ECPAT's group sessions, they and other young people are rebuilding their lives and making big plans for the future.